One of my better trades of this past year was Planet Fitness (PLNT - Get Report) . Having taken my profits off the table for this name months ago, and then forced into a position of having to defend my book throughout the fourth quarter equity fire sale, this non-dividend payer sort of fell off my radar, until I noticed one thing. 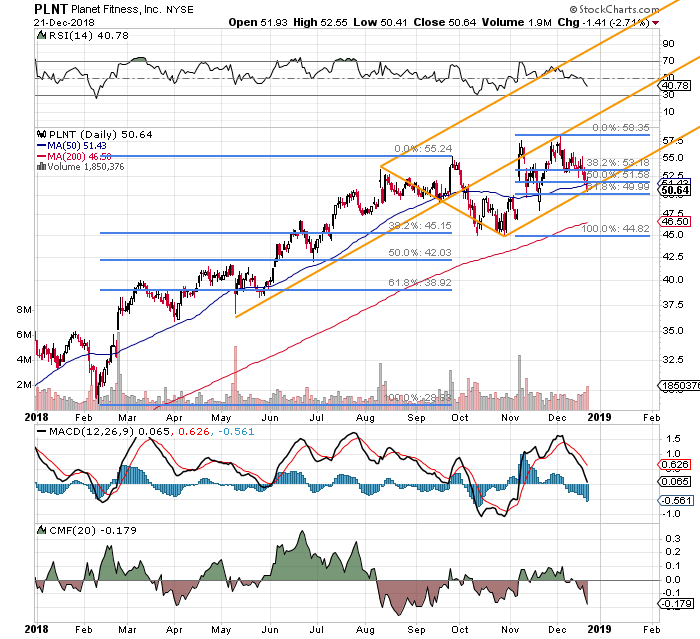 PLNT had indeed been volatile, but has in no way taken the beating that everything else has. For those not in the know, Planet Fitness has been a pioneer in a different kind of gym. The chain focuses on regular folks just trying to get back in, or stay in shape, and they do it at a discount. No frills, huge scale. As the holiday season comes to a conclusion, folks are going to get off the couch, and after they see their financial statements, they are not going to want to spend a lot to do it. This stock might just be set up to resume its outperformance after a recent swoon. The stock is in a state of weakness for the first time in weeks. Relative Strength has turned lower, while both the daily Moving Average Convergence Divergence (MACD), and Money Flow have suddenly made sharply negative moves. Currently, PLNT trades at an almost precise 61.8% re-tracement of its early November earnings-related rally, and at the lower trend line of the still intact Pitchfork model. The company will report its fiscal fourth quarter results sometime in February. Planet Fitness does appear somewhat expensive trading at 35 times forward-looking earnings. Yes, that is a bit dangerous. Then again, this is a growth stock, with no impact or exposure to trade conditions. Nearly all of the chain's 1,600 locations are domestically operated, just a few international outlets scattered around the Western hemisphere, meaning that revenues are not greatly exposed to currency risk. Total debt looks a little high when compared to cash and equivalents, but comes to much less than total assets, and cash seems to be growing rapidly at that. Operating and levered cash flows are positive, Both current and quick ratios appear more than fine. Should support at current levels fail, the chart, and history both suggest the $45 level as a catch-point. Understand that mining a market in a state of confirmed correction for longs is risky business before we move on. -- Purchase 100 shares of PLNT at or close to $50.64. -- Sell (write) one PLNT $55 February call (last: 1.69). Note: The sale of the earnings-related options "strangle' will produce an aggregate credit of $2.69, reducing the trader's net basis to $47.95. Should the shares rise above $55 by expiration, the trader is committed to the sale, and will be forced to take a 14.7% profit. Should the shares drop below $45 by expiration, this trader will be committed to purchase a second lot of 100 shares at that strike price, leaving the trader long 200 shares at a net basis of $46.48. At the time of publication, Guilfoyle was long ADBE, AMZN equity.